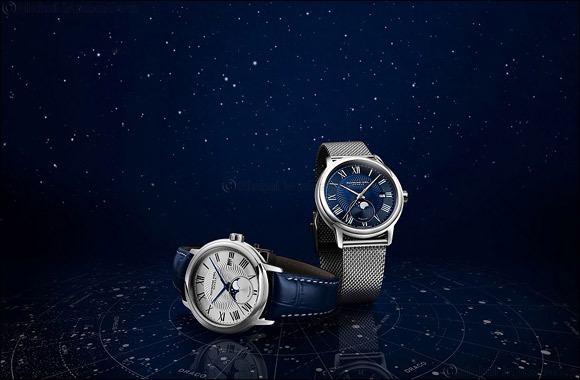 Dubai, UAE, June 21, 2018: Swiss luxury watchmaker RAYMOND WEIL is delighted to unveil the maestro Moon Phase, a classically styled timepiece featuring an elegant moon phase indicator. A complication synchronizing the rhythms of time with the poetry of the stars, developed in the pure Swiss watchmaking tradition. RAYMOND WEIL's new maestro Moon Phase is powered by a Swiss automatic winding mechanical movement: the RW4280 and is presented in a sleek 40mm diameter steel case for a refined and classic look. Created with passion, this timepiece presents a moon-phase indicator positioned at 6 o'clock offering a stellar view via a crescent-shaped aperture. The watch presents itself with a delicate wave-like decorated blue, silver or grey dial, sleek Roman numeral hour markers and elegant hands displaying time in complete harmony. The current date is cleanly revealed through the aperture located at 3 o'clock while the case-back is fitted with a pane of sapphire crystal, disclosing the mechanical movement. The final note to perfect the maestro Moon Phase is the matching blue genuine leather strap or steel mesh-type bracelet, both paired with a stainless steel folding clasp and a double push-security system. This new model is offered in five variations all symbolizing the Brand's deep attachment to its watchmaking roots.